Hope everyone's Labor Day weekend was a delight! This month we've got three items on offer and we're starting with something new. Beet Balls! We begin a similar mixture as used with the Backyard Beet Burger, load it up with Italian spices and then roll it out into the best little balls of beet you ever did taste. Next up, and by repeated request from all of you, we're bringing back the Sweet Potato Gnocchi. You know what they go great with? Beet Balls! Finally, it wouldn't be a monthly menu without our Backyard Beet Burgers. Come visit us at the Van Vorst Farmer's Market for specials and vegan treats! When ordering online, there will be a field for you to indicate which you prefer once you order. If you live in Hoboken or NYC, there is a minimum order requirement of $40. Unless you work with my husband, in which case he can bring you whatever you'd like! *Note: We will not be at the farmer's market on either Saturday, Sept 17th or 24th. August is upon us and the grilling season has been in full swing for a while now. You know what's great for grilling? Burgers! So great, in fact, that this month we're offering two different burger options to help you fulfill your burgery cravings. As always, the Backyard Beet Burger is on offer and ready for your belly. Joining it is the triumphant return of our Eggplant Masala Burger and a limited quantity of Lentil Pierogi. Want to buy a bunch of burgers? Cool! Discounts are available if you order through the website. By the way, thanks to those of you that have provided feedback on our ordering process. We've made some adjustments that should make things silky smooth. If you have ANY feedback about the process, the food, the packaging, anything, please let us know. We are continuing to refine as we go to make this as great of an experience as we can for you all. One example of this refinement is the timing for placing orders. Gone are the days of wondering what the new deadline will be for placing orders. From here on out, you simply need to place your orders by the end of the month. Easy as pie. (I never got that saying. Have you ever tried to make a pie? It's not easy. Alas, I don't make the rules when it comes to colloquial idioms). We will then either arrange a time to deliver your order the following week or you can pick it up at the Van Vorst Farmer's Market. When ordering online, there will be a field for you to indicate which you prefer once you order. If you live in Hoboken or NYC, there is a minimum order requirement of $40. Unless you work with my husband, in which case he can bring you whatever you'd like! This signature burger is a mix of beets, root vegetables and hazelnuts, with a satisfying herb finish. A fan favorite! The burgers come pre cooked and ready to eat after defrost but we recommend cooking in a pan with oil. Local farmers market eggplant, black beans, roasted pumpkin seeds, bell pepper, brown rice, caramelized onion and a personal spice blend. Enjoy it on burgers, wraps, or sandwiches for work with our Smoky Chipotle Aioli, recipe found on my blog. Burger comes pre-cooked and frozen, ready to eat after thawing but we recommend cooking on pan with oil for 4 min on both sides. 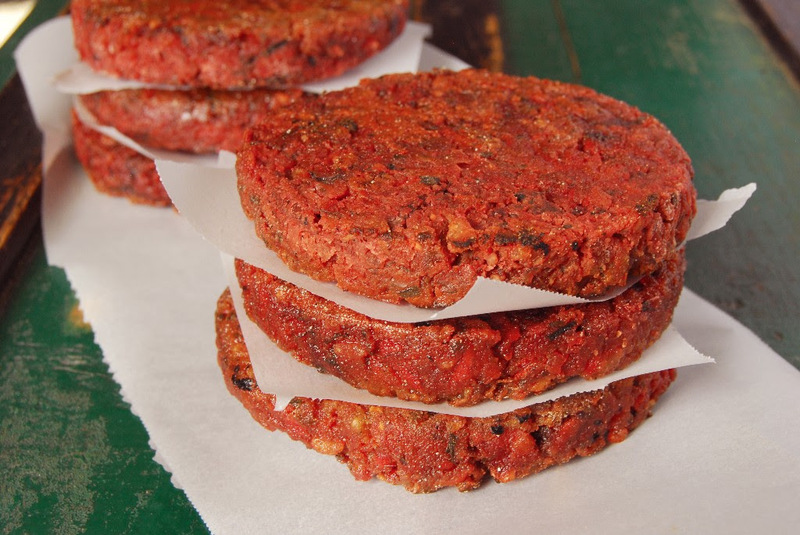 All veggie burgers are packaged in heavy duty freezer paper. Large orders of 40 or more can be vacuumed sealed in freezer bags. "Escaping the Restaurant Industry's Motherhood Trap"
Just a quick little post for you to check out this great article in EATER about motherhood in the restaurant business. Also, I am in love with the illustrations done by Lindsay Mound. Aioli gives so much flavor to your veggie burger or fries and is super easy to make. If you don't have some of the ingrediants, just substitute for a spice you like. Mix all ingrediants with a fork and chill until ready to eat with food. 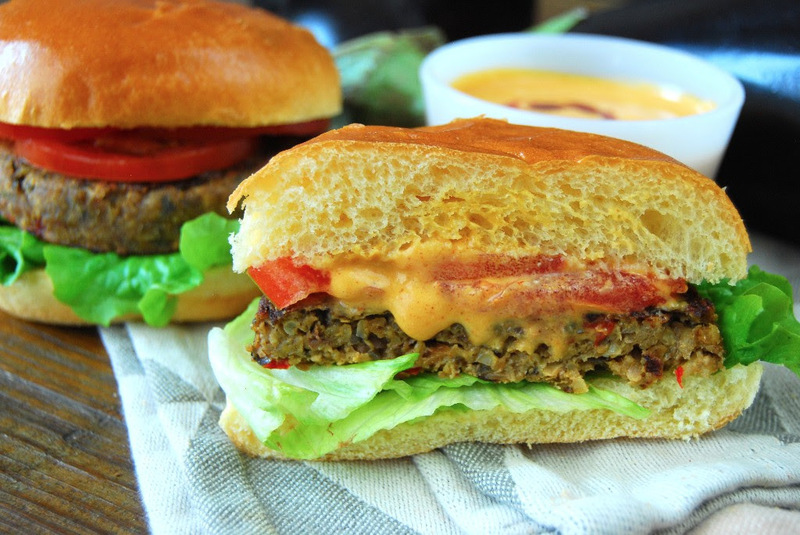 Really enjoyed the flavors of this chipotle lentil burger. Just needs a little more adjusting and it will be fantastic.